December 26th, 2016 | News and Events, Wheaton World Wide Moving. 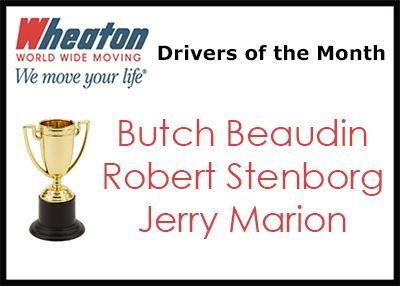 Direct Lease Driver of the Month, Butch Beaudin, Conrath, Wis., is a veteran driver with more than 40 years of experience as a professional household goods mover. Butch has a great driver rating and this is his eleventh Driver of the Month award with the van line. Butch also was named Driver of the Year in 1996 and 2002. Robert Stenborg, Coast Valley Moving & Storage, Inc., San Clement, Calif., earned Wheaton’s Permanent Fleet Driver of the Month award. Robert has more than sixteen years of experience as a professional mover and this is his second Driver of the Month award. Jerry Marion, Smoky Mountain Moving Service, Inc., Sevierville, Tenn., earned Wheaton’s Intermittent Fleet Driver of the Month award. Jerry maintains an excellent performance rating and has more than 35 years of experience as a professional mover. This is his fourteenth Driver of the Month award. Jerry also has been named Driver of the Year on four occasions.